Virtual testing takes place on the River Aire as part of the Leeds flood alleviation scheme. The Environment Agency has carried out a virtual test to ensure work to install a moveable weir on the River Aire is winter ready. 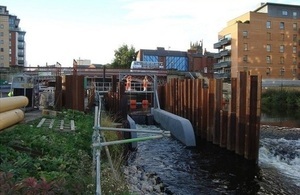 Installation of the weir at Crown Point, a first for UK flood alleviation, is just one element that Leeds City Council, in partnership with the Environment Agency, is delivering as part of Phase 1 of the Leeds flood alleviation scheme. The virtual test was carried out on Thursday 20 October. Half the river was blocked earlier in the year when 1,500 tonnes of rock was dropped into the channel. The rock was used to create a platform for heavy plant vehicles needed to drive in sheet piles to create a dry working space. Once the space was created work to remove the existing weir could begin. As the normal width of the river has had to be reduced for the work to go ahead, a penstock has been installed in the fish pass at the side of the weir. The penstock essentially acts as a gate to manage water levels. Crucially, it is used to mitigate the risk of flooding during the construction phase of the moveable weir. When raised, upstream river levels can be lowered when high flows are expected in the river. We are doing an exercise with Leeds City Council to ensure the procedures that we have jointly agreed to operate the penstock run smoothly. The council’s contractors, BAM Nuttall, will be working with Environment Agency staff to respond to a simulated flood event in Leeds. A vital part of increasing our resilience to flooding is ensuring we are prepared to respond to any flooding this coming winter. The exercise we’re carrying out today will test our incident planning and response. Further downstream, work to replace Knostrop Weir is well underway with the third weir gate now being installed. Once complete, the moveable weirs at Crown Point and Knostrop will be capable of lowering river levels during flood conditions. Elsewhere, the majority of the flood walls on the River Aire are now complete. This includes glazed flood panels in locations such as the former KPMG building and Victoria Quays. Work to install flood defences along Hol Beck has now started.